November 15, 2013 When I first heard that Tariq Ramadan, the world’s most charming Islamist, had been invited to give the prestigious Orwell Prize lecture, I thought it was some kind of joke. Maybe someone in the Orwell organisation had simply read the sub-title of Caroline Fourest’s biography, Brother Tariq: The Doublespeak of Tariq Ramadan, and — conflating it with the ‘doublethink’ invented by Orwell in the novel 1984 — believed Mr Ramadan was an expert in the concept rather than someone who is accused of being one of its most sophisticated practitioners. Whatever the reason, Brother Tariq was asked to give the lecture, named in honour of one of Britain’s finest ever political writers, and duly delivered it on Tuesday this week. Mr Ramadan is Muslim Brotherhood aristocracy. His father, Said Ramadan, led the movement in Europe and married the daughter of Brotherhood founder Hassan al-Banna. He saves his fiercest polemic for the colonial West and its Zionist allies Mr Ramadan has made a career of representing himself as the reasonable face of political Islam. British academia is convinced. He is professor of contemporary Islamic studies at Oxford University, and the Orwell lecture was given at University College London. I have met Mr Ramadan and he comes across as a reasonable man, although he has a tendency to represent those who challenge him as warmongering neo-cons. He has probably done more than any other individual to promote the idea that the West should have nothing to fear from the ideas of Hassan al-Banna or from Islam as a political system. Understandably, considering his heritage, Brother Tariq is deeply critical of the overthrow of the Muslim Brotherhood in Egypt. 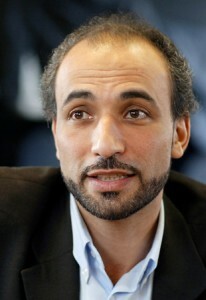 Tariq Ramadan is best described as an independent power center within the Global Muslim Brotherhood who has sufficient stature as the son of Said Ramadan and the grandson of the founder of the Muslim Brotherhood to challenge positions taken by important Brotherhood leaders. His statements and writings have been extensively analyzed and he has been accused by critics of promoting anti-Semitism and fundamentalism, albeit by subtle means. On the other hand, his supporters promote him as as example of an Islamic reformer who is in the forefront of developing a “Euro Islam.” Ramadan is currently Professor of Contemporary Islamic Studies at the Oxford University (Oriental Institute, St Antony’s College) and also teaches at the Oxford Faculty of Theology. He is Visiting Professor at the Faculty of Islamic Studies, (Qatar) and the University of Malaysia Perlis; Senior Research Fellow at Doshisha University (Kyoto, Japan) and Director of the Research Centre of Islamic Legislation and Ethics (CILE) (Doha, Qatar). In 2009, Ramadan was dismissed from his positions as an adviser on integration for the city of Rotterdam and from a Dutch University over his role as a talk show host on Iranian TV. A ban on Ramadan traveling to the US was lifted in January 2010 and since then he has appeared a number of times in the US to speak at events organized by various US Muslim Brotherhood organizations. The Research Center for Islamic Legislation and Ethics (CLIE), headed by Ramadan, was launched in January 2012 and represented a significant coming together of Global Muslim Brotherhood leaders Tariq Ramadan and Youssef Qaradawi. In July, the GMBDW reported that Ramadan had penned a long article in which he not so subtly implies that the overthrow of former Egyptian President Mohamed Morsi was orchestrated by a conspiracy involving the US and Israel together with what he alleges to be their “Salafist ” allies.